ART - just do it! 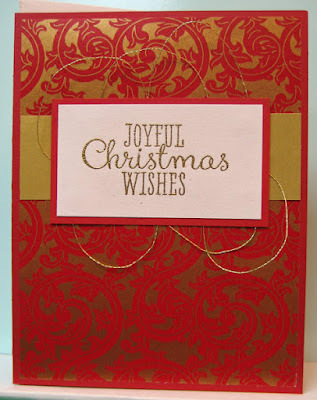 : A joyful Christmas card!! I have been working on clearing the back log of card kits I have on my desk from past classes. This kit was a Valentine's one so I dug through my greeting stash and found this perfect greeting which was gold embossed. I trimmed it a bit, layered it onto red and added some gold embroidery thread in loops on the back. A technique which I have seen on Splitcoast Stampers lately!! I used regular tape to secure the thread on the back of the greeting. I glued decorative paper to the front of the red card, added the gold strip then layered on the large greeting I had created!! It is one more Christmas card for my stash!! I have been remiss in getting my Christmas cards made for January and February so this is a start! !